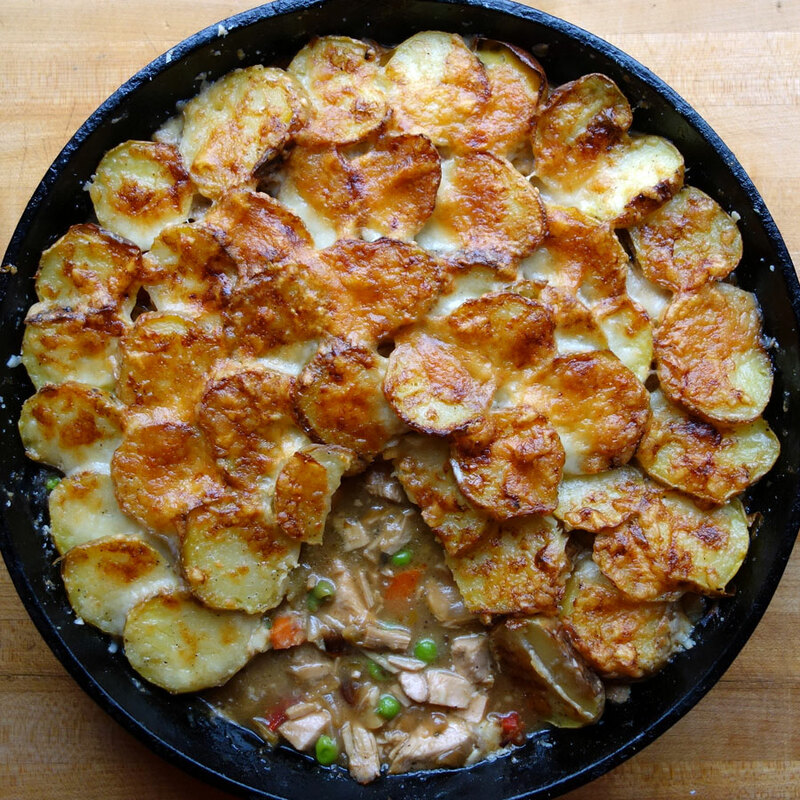 What if Lazy Cheesy Turkey Shepherd’s Pie were a recipe from a compilation cookbook by the Junior League of Copake Lake, where we summered as kids near The Berkshires? It does sound like a recipe that would show up in one of those kinds of cookbooks from the 70’s. Sadly, Copake Lake was a bungalow colony for blue collar workers from the city. It was probably not fancy enough for a bowling league, much less the junior league. It would be cool if Lazy Cheesy Turkey Shepherd’s Pie was a recipe that some great stage actor from the glamorous days of Broadway that his mom made him growing. He insisted on eating it before going on stage every night because he has terrible stage fright and this comforting dish settled his nerves. Now that would be a good food story! What actually happened was I made this recipe up last week. I defrosted some leftover cooked turkey and some uncooked chicken thighs because I forgot about the former and had to cook them both. I had lots of plans to eat out over the weekend, but they had to be cooked and eaten. The chicken became gluten free Chicken Cacciatore. I may have had them both for breakfast over this past week. I LOVE eating leftovers for breakfast! I was surprised so many people wanted the recipe since April doesn’t quite feel like turkey season. After Thanksgiving, I’ll make this again! Some days mashed potatoes seem like too much work. You can save a step by roasting and slicing the potatoes for a lazy turkey shepherds pie and topping it with cheese. Preheat oven to 350F °. On a sheet pan, roast the potatoes, carrots, and parsnips until tender (about 30-45 minutes). Cool. At the same time, in a cast iron pan or small roasting pan, roast the onions for 15 minutes, then add the celery and the garlic until onions are browned. Put the onion mixture in a bowl to cool. In a small saucepan, bring turkey stock to a boil and reduce it by a third. Roughly dice the cooked carrots and parsnip and add it to the bowl with the onion mixture. Slice potatoes into rounds and have ready. Heat the fat/butter in a 10” cast iron pan over medium heat. Whisk in the flour to make a roux, then add the stock along with the vegetables and sage. Season mixture with salt and pepper and cook for a few minutes, stirring constantly until the gravy thickens. Turn the heat down to low, add the peas and the turkey and cook until everything is heated through. Adjust seasoning again if necessary. Turn off the heat. Top turkey mixture with the potatoes in an overlapping pattern. Using a pastry brush, brush the potatoes with cream, season with salt and pepper and top with the cheddar cheese. Turn on the broiler and cook until the cheese is golden brown about 10 minutes. Serve. You can use a heavy stainless or enamel skillet instead of the cast iron skillet or a baking dish.